Courses are entered in the Course Library. The Course Library maintains a list of any number of courses which your golfers can play. If your league plays 9 holes (front OR back nine) each league event, enter each of the 9-hole courses that you play (usually front and back of one course) as a separate course. If your league plays 18 holes (front AND back nine) each league event, enter each of the 18-hole courses that you play (could be just one course) as a separate course. To access the Course Library, on the Setup menu click Course Library. To add a new course, click the New button (above image). 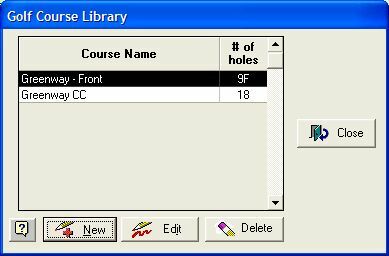 Type in the Course Name and mark the Number of Holes for the course (18, 1-9, or 10-18, or you can specify hole numbers). Address, phone, and golf-pro information is optional. To enter a tee box, select a tee to edit and click the Edit Tee button. Set the Tee Name and Abbreviation. Type in the Rating and Slope for both men and women. Ratings: Course ratings are required for the correct calculation of handicaps. Slopes: Slopes are required if you need to convert indexes to handicaps. If a course does not have a set slope, leave the slope set to 113. 113 is the default for an un-sloped course. Enter the yards, pars, and handicaps for each hole. Note: Pars and hole handicaps are required for each tee your golfers will play. The program will not function correctly without this information. 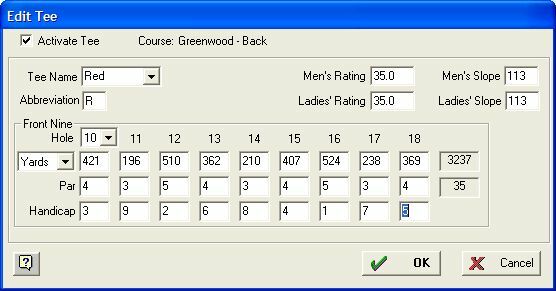 The course ratings and slopes are used for handicap calculations. The pars and hole handicaps are required for the automatic calculations. Yards, pars, and hole handicaps appear on reports and scorecards.